Thinking Pinoy: 1979 Iranian Revolution means Marcos didn’t kill Ninoy? 1979 Iranian Revolution means Marcos didn’t kill Ninoy? Who killed Ninoy Aquino? The 1979 Iranian Revolution suggests Marcos' didn't do it. The Supreme Court recently decided in favor of burying the remains of the late Ferdinand Marcos in the Libingan ng mga Bayani. The pro-burial crowd urged healing and closure, but the anti-burial crowd said the Marcos Family should return its ill-gotten wealth and pay for the gross Martial Law-era human rights violations before discussions on healing and closure can even begin. In my August 2016 article “Marcos in LNMB? Leni Robredo really is a terrible lawyer”, I explained that the 30 years’ worth of Aquino neglect made Marcos’ LNMB burial. That is, the Aquino political dynasty, despite having control over the legislature for so long, neglected to pass even one law – or even file one bill – that would make Marcos’ LNMB burial illegal. Because of the Aquinos’ neglect, the doctrine of nullum crimen, nulla poena sine lege (there is no crime when there is no law punishing it [SC GR 176364]) – applied to the Marcos case. The irony of it all is that Benigno “Ninoy” Aquino Jr.’s namesakes both failed miserably in preventing this from happening. Benigno Simeon “Noynoy” Aquino III was a senator for six years and a congressman for nine yet he still failed to even file one bill about it. The same goes with Senator Paolo Benigno “Bam” Aquino IV, who has been a senator for 3 years and counting. PNoy was also president for six years, so he had to power, as the Commander-in-Chief of the Armed Forces, to issue a simple order banning Marcos LNMB burial – a power that he never exercised. Seriously, if the anti-burial crowd thinks Marcos’ LNMB burial is a the biggest insult to this nation’s history, then I guess they should start suing Noynoy and Bam for criminal negligence [BatasNatin]. Of all the people killed during Marcos’ time, the highest-profile victim, perhaps, is Benigno “Ninoy” Aquino Jr., who was shot dead on the airport tarmac after returning to the country in 1983. And now that we’re at it, why don’t we examine the circumstances surrounding his death? After all, it was Ninoy’s death has been used – ad nauseam – as the prime example of Marcos atrocities. His death triggered the chain of events that culminated into what was the First EDSA revolution. Ninoy’s death catapulted an erstwhile unpalatable Cory Aquino to the presidency. And most importantly, Ninoy’s death is the symbolic anchor of everything that the Yellow Camp stands for. Hence, let’s ask: who killed Ninoy in the first place? Ferdinand Marcos, Ninoy’s archenemy is the easiest answer to this question. The problem, however, is that this answer is too easy. I have been blogging about contemporary Philippine Politics for about a year now and if there’s something that I have learned after having written 200 articles, it’s that digging a little deeper usually shows a different, and often more sinister picture. Thus, after a bit of digging, let me first tell you why I think Marcos couldn’t have ordered Ninoy’s assassination. Ninoy was the poster boy of the political opposition and his popularity in the 70s and 80s is unquestionable. Killing him will make him a martyr, and martyrdom can catalyze revolutions. We all know what happened after Ninoy died: widespread unrest, the EDSA revolution, Marcos’ overthrow, and the installation of a Marcos-less government. We can all call Marcos diabolical, evil, murderous, or even genocidal. But if there’s one thing that Marcos is not, it’s stupid. Yes, even Marcos’s staunchest critics will concede that the old man is extremely cunning and smart. Could Marcos have foreseen such a possibility? Well, because four years prior to Ninoy’s fateful (and fatal) homecoming, a similar – almost identical – chain of events happened in Iran, and it’s called the 1979 Iranian Revolution. Marcos should have been very aware of the events in Iran, as no one can argue that Iran was outside Marcos’ radar. Marcos’ wife Imelda seems to have been close to (or at least, was very interested in) the Pahlavis of Iran. On the way home from Rome in 1969, Imelda stopped by Iran to visit the Shah. Imelda was also part of a diplomatic visit to Iran in 1971 for the 2,500th Year Celebration of the Persian Empire [Garcia 2016]. I will now give you a rundown of that chapter in Iranian history, then I will explain how it paralleled the Philippine situation in the months preceding Ninoy’s assassination. Context is essential, so before I talk about the 1979 Iranian Revolution, let me give you a quick background of the events that happened before that. Since the early 1900s, a single British company, the Anglo-Iranian Oil Company (AIOC), had a monopoly over Iran’s vast petroleum resources. At the time, AIOC was the most profitable British company on the planet [CBS]. AIOC is the predecessor company of today’s British Petroleum (BP) [Henniker 2013]. AIOC’s cheap oil fueled UK economic boom, cheap oil made possible by the exploitation of Iranian workers, causing discontent to spread among the population. Reza Shah, the ruling Iranian monarch, struck a 1933 agreement with AIOC, with the latter promising to give laborers better pay and more opportunities for advancement, build schools, hospitals, roads and a telephone system. AIOC didn’t fulfill its promises [NWE]. In 1950, the Iranians found out that the United States, which historically monopolized Saudi oil through the American Arabian Oil Company (today’s Saudi Aramco), agreed to split profits 50-50 with the Saudis [PSU]. The Iranians, who have been receiving pitifully miniscule royalties from AIOC, wanted a similar deal with the British. The Britons rejected their demand [NWE]. Britain continued to exercise control over Iran’s natural resources, and Iranians continuously protested over their lack of power in their homeland. This feeling of helplessness among Iranians fueled nationalistic sentiments, and nationalism for Iranians means taking back control of Iranian oil. In retaliation to the British, the Iranian Parliament voted in 1951 to nationalize the AIOC and installed nationalist Mohammed Mossadegh as Prime Minister[NWE]. The UK retaliated by launching an ICJ case versus Iran, but the ICJ dismissed the case in 1952 for lack of jurisdiction, as the ICJ affects only treaties ratified from 1933 onwards, and the treaty concerning AIOC was signed before that [ICJ: UK vs Iran]. The UK did not give up. Enlisting help of the CIA, the UK covertly supported the 1953 Iranian coup d’etat which overthrew the democratically-elected Mossadegh [GWU], turning Iran from a constitutional monarchy to an absolute monarchy with the House of Pahlavi at the helm. Thus, after two short years of relative independence, Iran was under UK control again – all in the name of oil. The pre-1950’s social unrest was back after the 1953 coup. Yes, it’s back again, and it became the sleeping monster that was the foundation of the 1979 Iranian Revolution. Dissent against the Pahlavi dynasty intensified, with religious leader Ayatollah Khomeini serving as the figurehead after he urged in 1963 the ruling Shah to recognize the government’s mistakes and to abandon Western dependence… and calling the shah a “miserable wretch” in the process. Khomeini was the first major figure to speak against the monarchy, as everyone fears violent retaliation from the government [Providence]. And surely enough, he was put in jail and while incarcerated, Ayatollah Khomeini slowly became a symbol of the Iranian opposition.Over a decade later in October 1977, Khomeini’s son and chief aide Mostafa mysteriously died. The government said it was a heart attack, but the public believed it was a covert government-sanctioned assassination [Spencer 2016]. The public saw Mostafa’s death as an attack against the Khomeini family, which at the time was at the forefront of the resistance. Widespread, long term anti-government protests in major Iranian cities followed. Public sentiment continued to grow against the Pahlavi regime and in September 1978, the Armed Forces fired against thousands of protesters, killing dozens. Known as Black Friday, this was the pivotal event of the 1979 revolution and the start of the Pahlavi Dynasty’s downfall. The ruling Shah fled Iran in January 1979 and Khomeini returned from his exile in France and Iraq to fill the power vacuum [UChicago]. The Khomeinis and their allies have dominated Iranian government from then up to this day. To make comparisons easier, let’s think of the Iranian Revolution as a recipe, i.e. a set of ingredients processed in a certain sequence. First, widespread discontent among the masses: the oil issue bugged Iranians for decades, and the uneven economic growth of post-1953 Iran simply added fuel to the fire. Second, an oppressed but popular opposition: we are referring not only to the Khomeinis, but also the political opposition that was also the victim of the repressive Pahlavi Regime. Third, a suitable and willing establishment-backed replacement: Ayatollah Khomeini, who the public sees as the one with the “moral ascendancy” to lead Iran should the Pahlavis be overthrown. Fifth, a powerful catalyst: the perceived martyr Mostafa Khomeini. Now, let’s check the Philippine Situation before August 1983 and see which of these ingredients were already present at that time. First, widespread discontent of the masses, stemming from Martial Law human rights violations, was already present before the 80s. Some pro-Marcos camps may argue that these excesses were confined to a small chunk of the population, but the fact remains that these events were sufficiently publicized [TP: Mosquito Press] to make the masses care enough about what’s happening. Adding fuel to the fire is the economic recession that started in 1982, a year before Ninoy’s assassination [WB]. Second, an oppressed but popular opposition: The relatively popular Liberal Party of the 70s and 80s, starting from the fateful 1971 Plaza Miranda Bombing [MT], has always been seen as the oppressed opposition. Third, a suitable and willing establishment-backed replacement: here’s where Ninoy Aquino comes in. He is, after all, the poster boy of the oppressed opposition. Other potential replacements were Marcos-era Opposition leader Salvador Laurel [MT], Defense Minister Juan Ponce Enrile [Kawato 2015, p. 165], and Philippine Constabulary Chief Fidel Ramos, and Marcos billionaire lackey Ambassador Eduardo “Danding” Cojuangco [TP: Coco Levy]. Fourth, a flurry of crowd mobilizers: the Catholic hierarchy headed by oppositionist Jaime Cardinal Sin can provide the warm bodies. Since 1972, Sin has been critical of the Marcos regime [Guardian]. Thus, we are left with the fifth and final ingredient: a catalyst. Marcos could’ve pretended that he’s still the most popular guy around, but he most probably got a wake up call when he allowed Ninoy to speak on national TV in 1978. The streets were empty as everyone watched Ninoy live [Unjieng 2009, p.133], just like today’s streets when Pacquiao has a boxing match. Marcos knows killing Ninoy is a bad idea. Despite having been out of the public’s eye during his six-years-and-counting detention, the public’s interest in Ninoy seems to not have abated. Yes, the Philippine situation in the years preceding 1983 was almost ripe for a revolution, and the only thing that’s missing is the fifth ingredient: a powerful catalyst, and Marcos should have known the entire time that Ninoy Aquino was a (if not “the”) potentially powerful catalyst. In 1980, Marcos allowed Ninoy to fly to the US to receive medical treatment [NYTimes]. 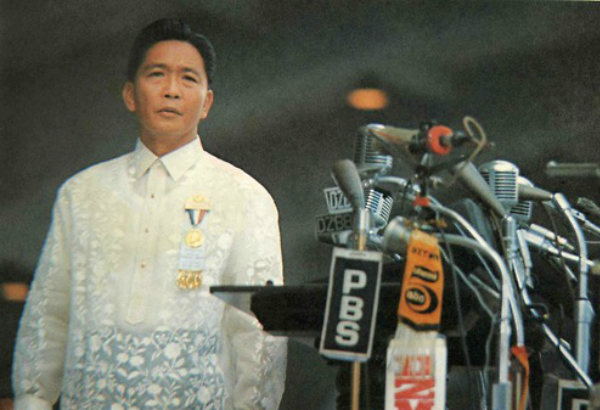 In 1981, he lifted martial Law, along with the release of 341 inmates, half of which are political prisoners [GovPH]. In a 1982 bid to restore the 'prestige, integrity and good name' of the scandal-plagued Philippines Supreme Court, Marcos accepted the mass resignation of all 14 justices [UPI]. What’s clear, by early 1983 at the latest, is that Marcos was feeling the heat. Already old and sickly [Unjieng 2009, p.133], Marcos knows that his grip on power was precarious at best. And the last thing he’d want would be to kill Ninoy, as that will provide the fifth and final ingredient for his fall from grace. This bears repeating: given the circumstances and the events immediately preceding 1983, killing Ninoy will trigger a revolution, an overthrow of the Marcos autocracy. If Marcos killed Ninoy, then Marcos must be stupid. But Marcos is not stupid, right? So if Marcos didn’t kill Ninoy, who did?